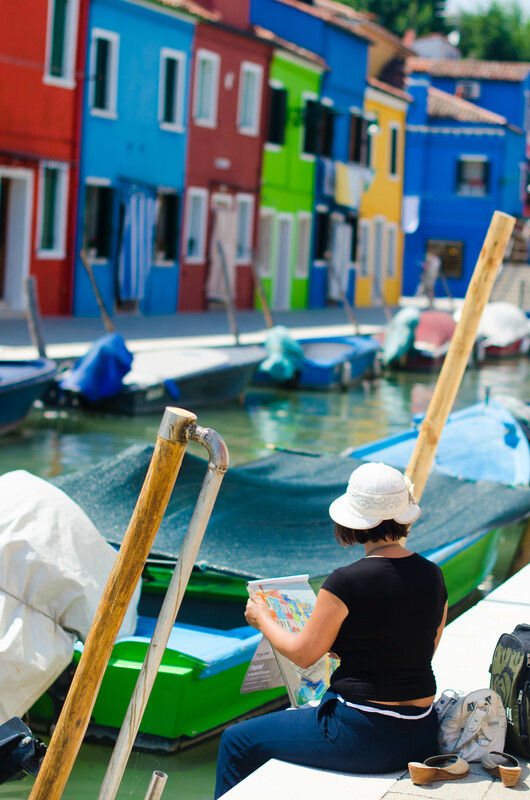 There are two major themes in Italy that are constantly present at all times. Love and Art. They are everywhere. They fill the city and are entirely infectious. Every moment I go out to seek human interaction, those themes appear in front of me and I can’t help but capture them, to save them in my camera for a moment when I need some inspiration. 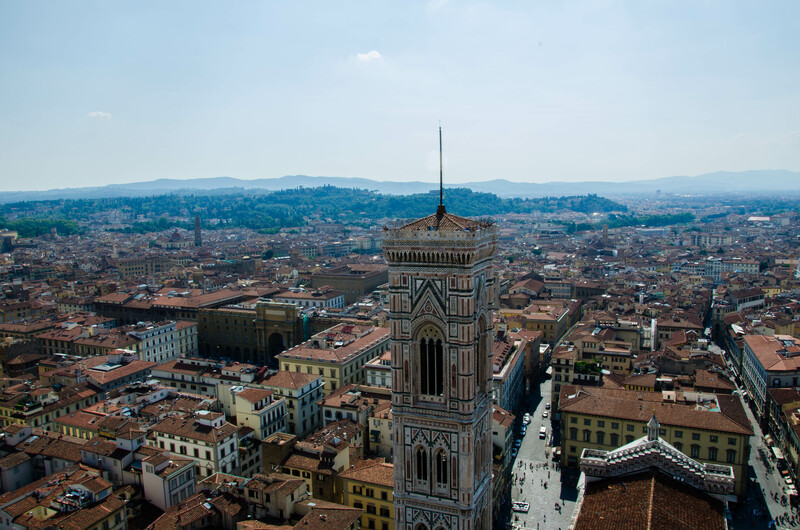 My immediate introduction to Florence was a little unnerving. 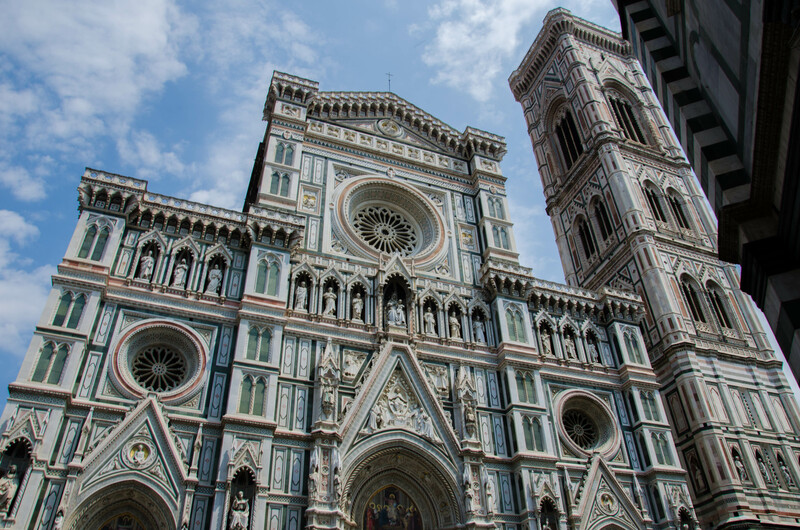 Booking hostels on the fly can be really difficult during high season, so instead of going to Cinque Terre like I had planned, I decided to head to Florence on Thursday and make Cinque Terre my destination on Monday morning. The hostel I booked was supposed to meet special hostel standards so I figured it would be a fine place to stay, even though it was a tad of a distance away from the city centre. No big deal! Luck was on my side when I booked my train tickets Thursday afternoon. I arrived in just the nick of time after a mad dash to the ticket office. The lady at the station gave me the very last second class ticket and laughed in relief as she did so. Someone was definitely looking out for me. After arriving at my stop, directions in hand, I found a bus that seemed like it was going in the right direction. I politely mumbled some half Spanish to the bus driver who seemed like he absolutely hated his life and asked him if it stopped at Salvatino. He grunted a loud “si” and slammed the doors behind me. Okay…not the greatest greeting from the locals, but I went on my way. I was practically thrown off the bus in the middle of nowhere outside a gate that read Ostello. I was given a name for the hostel but it appeared nowhere. I assumed it was the correct entrance so after confirming with the man at a cafe near by that it was, in fact, the right destination, I hesitantly creeped in through the doors. I half expected those to slam behind me as well like they do in the horror movies. Did I mention it was pitch black? I began walking further and further up a very steep hill. The winding path seemed to be never ending and I walked for who knows how long completely terrified that someone was going to pop out of the bushes (please god let it be Ashton Kutcher). When I finally heard the sound of voices, I asked some confused campers where I could find the entrance doors. Nobody seemed to speak any English which didn’t help my case. In the end, it was late and I was tired but I did find my room in one piece. Thankfully. 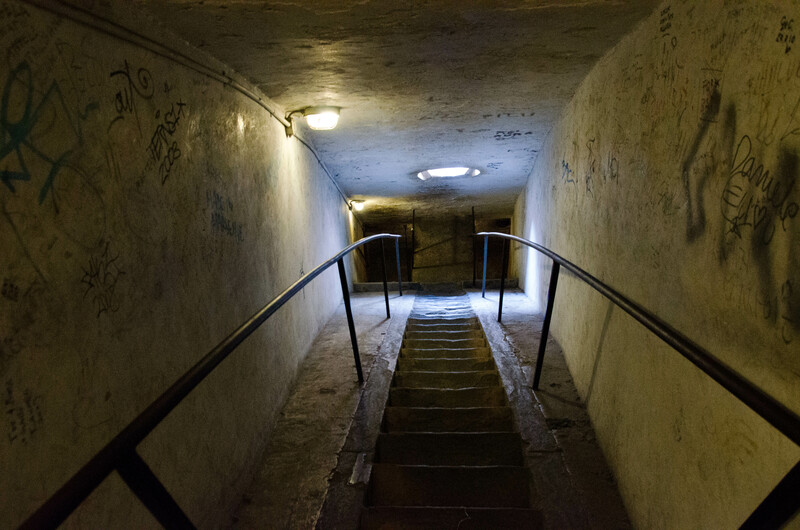 But what a weird experience…I’m getting ready for more of those dingy locations! I was greeted inside by two girls around my age from Austria. They were traveling together and seemed to speak great English! How sweet were they! Their names are Carmen and Magdalena and they’re from a place called Tyrol. We bonded quickly and I was so happy to hear they were staying until Sunday and didn’t have to leave so soon! I traveled to the city centre the next day. 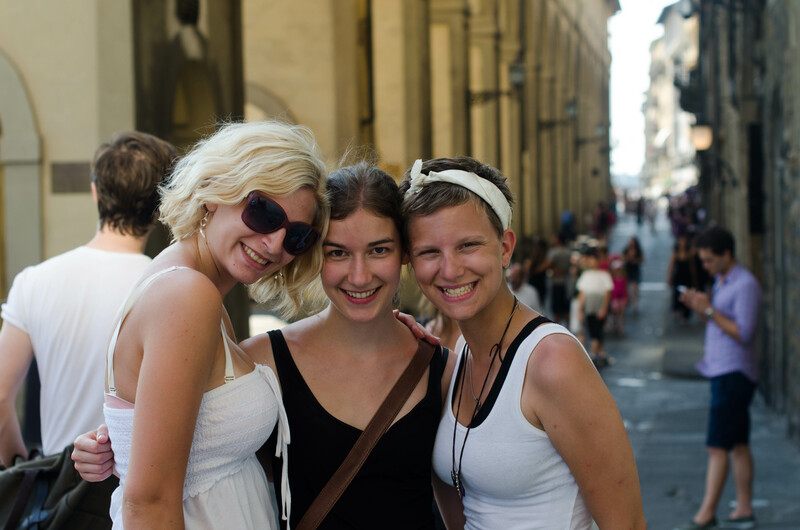 I had been awaiting Florence for quite a long time before my trip and it didn’t disappoint. The streets have a fairytale air about them. 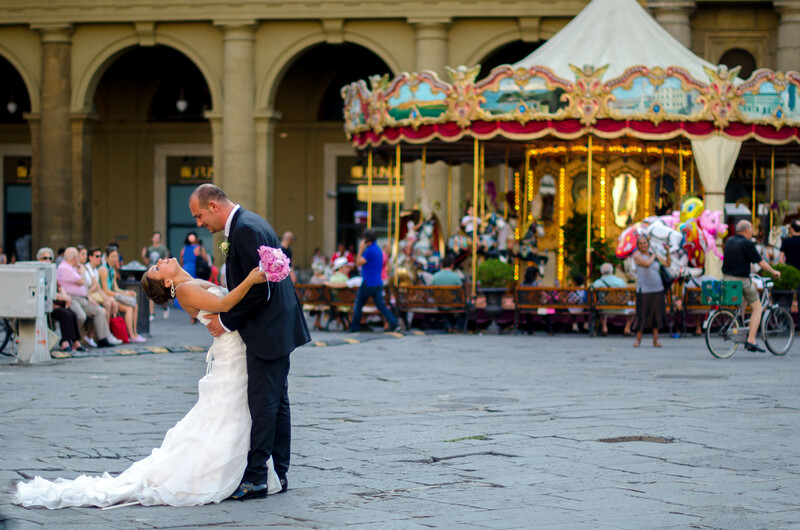 You can’t miss the centre of Florence. There lies the grandest, most wonderful, breathtaking Basilica of all time. It could eat the St. Mark’s Basilica for breakfast. 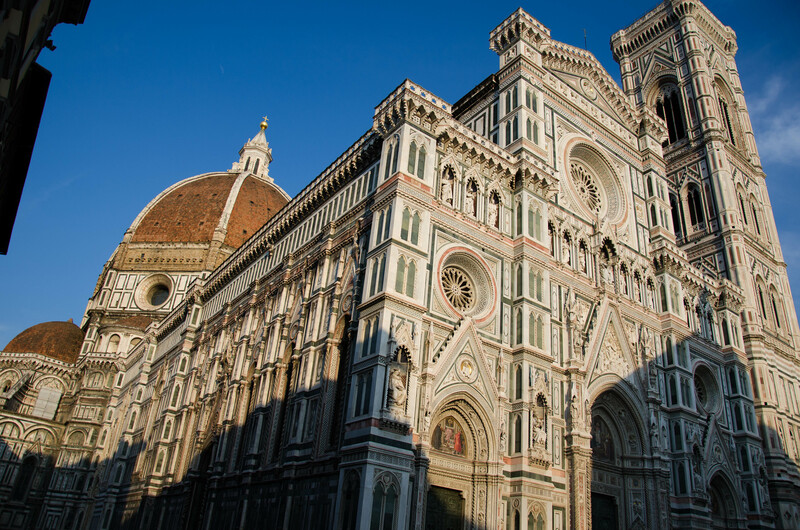 The formal name for it is The Basilica di Santa Maria del Fiore but everyone calls it the Duomo. I couldn’t fathom what I was seeing when I approached it. The detail and art on the outside of the cathedral is so intricate and it took just about 140 years to complete by two separate architects. Doesn’t seem incredibly long when you think about it. The inside represents a ton of Renaissance movement and the pushing of boundaries with both art and architecture. I decided to take a free walking tour since I was fascinated to hear about its history. This ceiling mural below was painted in only six years and represents a major theme within the church: the end of time. Half of the cathedral has more of a simplistic, one dimensional look about it inside while the other half introduced the idea of realism through windows, paintings and structure. It’s fairly clear when the second architect took over. It was actually built on top of an older cathedral that I was able to see parts of underground. A really neat thing that I had the chance to do was climb up to the very top of the dome. Yes, climb. There are 463 steps up a very narrow, sometimes spiral staircase and I climbed every one of them. Luckily, while walking up, I met an Italian named Enrico who was showing around a family he stayed with in the States. We chatted along the way which made the time go much faster. It really wasn’t too strenuous at all! Of course, the view at the top of the dome is entirely worth it. There’s really nothing like the view of an entire city. Especially one like this. 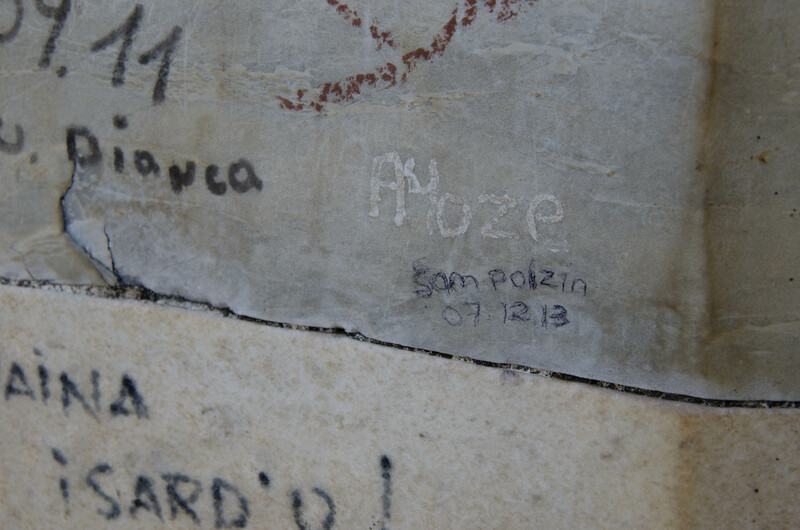 There were names written up the entire indoor staircase and all over the walls at the top of the dome. I walked around and around for ages just waiting for people to clear so I could write mine. I don’t know why I thought I would get scolded, there were too many names and phrases to count but I quickly scribbled mine in pen and was glad I made my mark! My all time favourite was written in big, bold letters. Earlier that day I had met a guy selling jewelry in the market named Roy. He saw my Canadian flag and said he had friends in Canada and thought we were very nice people (you thought right, sir). He pointed out some great spots to go during my stay, one of which was a huge garden called Piazza Michelangelo. “If you climb up the hill before sunset”, he said, you’ll have the greatest view!” I couldn’t miss that, could I? I decided to make it a special night. It was my first night in Florence, after all. I went to one of the many wine shops and got the cheapest bottle of wine I could find. Its price was equivalent to 5 Canadian dollars. But you guys, it was from Tuscany! I don’t think it matters! I bought a cheap pocket knife with a cork screw and headed in the direction of the garden. A lesson I’ve learned: maps are super deceiving. I could have sworn it wasn’t far away from where I was but I just kept walking and walking and walking until I finally reached a massive hill. I heaved my legs up the top but once again, it was all worth it in the end. 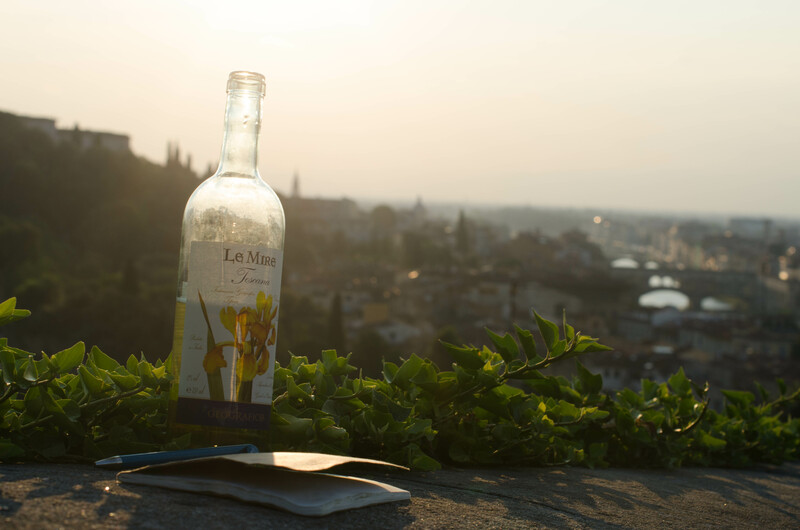 I was in the hills of Florence, overlooking the water and the roof tops and dammit I drank that wine all by myself and it was perfect. The sunset was stunning and I thought then that nothing could be more peaceful than where I was at that moment. Benvenuto Firenze. Classy is as classy does, I stumbled slightly drunk but super happy down that beautiful but stupidly steep hill to have dinner. Maybe I should have done that whole thing the other way around. That moment brought the nights end and although my time alone was exactly what I needed, I was hoping to spend some time the next day with my new friends. The three of us planned to spend the day together, taking a walking tour though the city and possibly visit an art gallery. We decided to go to a cute coffee shop a ways away from the tourist area and had some true European (and very strong) cappuccino. Oh and mark my words, I actually paid to go to the washroom that day. I’m not even sure what to say about that! The walking tour lead us to two amazing places. 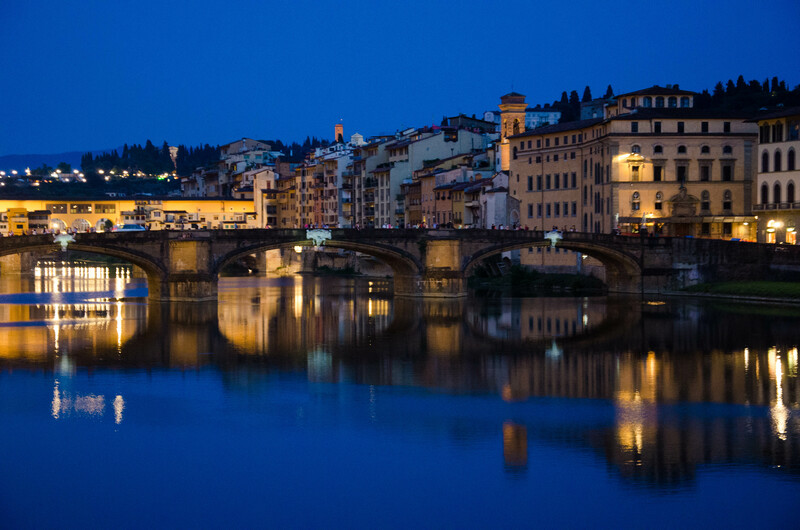 One was the Ponte Vecchio which is a famous bridge that has houses built along the edges and tonnes of expensive jewelry shops. Living there would either be cool or exhausting. I haven’t quite decided. You can barely move over the bridge but if you look above, there is a concrete corridor that was built for the Medici family to attend mass away from public view and to ship supplies during the second World War! The second amazing place we were lead to was a shop with the absolute best gelato I believe I will ever have. The tour guide specifically recommended it and it seemed to have won awards for the number one gelato in Italy. It’s called Gelateria della Passera. I dreamed wonderful dreams about Kiwi gelato last night. After a lovely picnic in the park, we parted ways. The two of them left this morning but I’m so glad I got the chance to know them. It was so exciting to learn about the different ways our countries run, the different foods we eat or even each others favourite books and hobbies. I had to fill them in on the poutine deal. How funny is it that no one in my room of six girls knew what a poutine was?! It makes complete sense that they wouldn’t, but when it’s something you’re so used to…you just don’t realize how exciting it is to talk about your life with someone who knows absolutely nothing about it! With blisters on my feet that I continue to ignore, I will venture to Cinque Terre tomorrow to walk the beautiful hike up through the 5 villages! 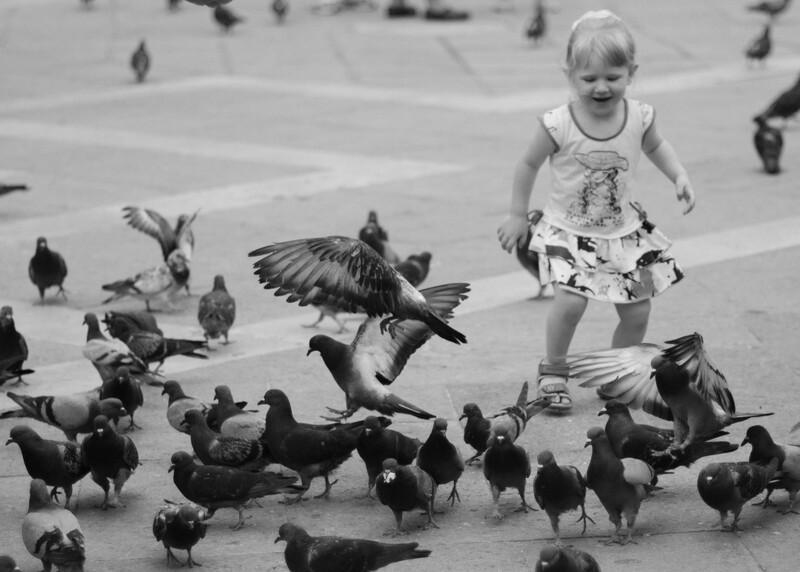 Keep in touch for a special story from Pisa soon to come! Hi Sam, Beautiful pictures. Hope you are gathering names and locations for all these people you are meeting so you canmaybe contact later. Sam! All the best adventures. When you said “and dammit I drank that wine all by myself and it was perfect” I could hear it! This is my faaaavvououurrrite before bedtime reading, and I believe it will be for the remainder of your trip (which has just begun!). 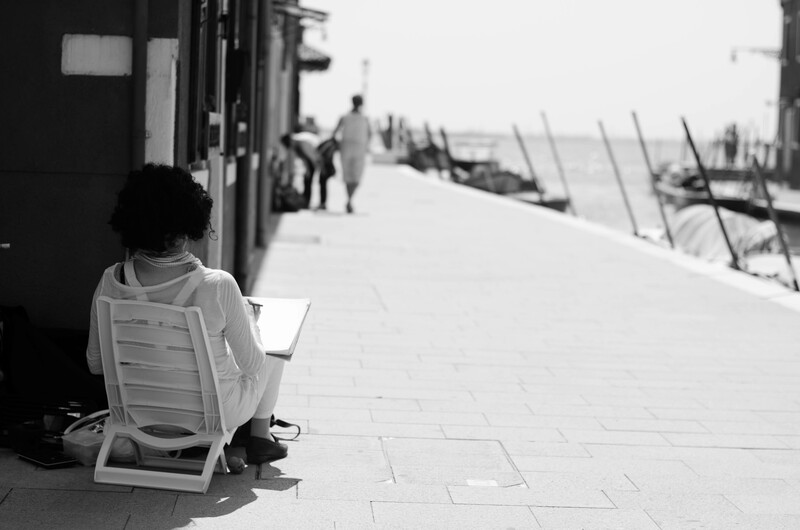 It’s good to be together with you through this writing. Hi Nanna! Glad you are following along and reading this! Thank you!! I’m definitely grabbing all the names of everyone! It will be so neat to have friends all over the world! Robin: It is so cute and fabulous that you read this before bed! Gosh I love you!